The fruit is crack tolerant yet not too tough for eating. 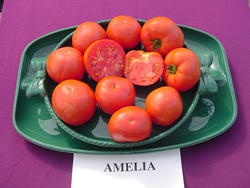 The plant has multiple disease resistance including Tomato Spotted Wilt Virus and Fusarium 3. It is described as having an armor-plate disease package along with high fruit quality and high yields of large tomatoes.